November 27, 2018 Bethesda has detailed the next set of Fallout 76 updates. Fallout 76 is getting a big set of updates over the next handful of weeks, including some of the PC features the community has most vociferously requested. 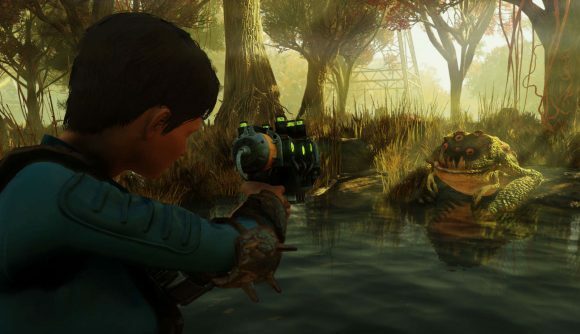 A number of fixes for some of the most common criticisms are coming in these next two patches, and Bethesda says this is the start of more open communication regarding what the team is working on and when the changes are coming. A December 4 patch will bring the stash limit up from 400 to 600. That’s a relatively minor bump, but the developers note that the original limit was a concession to server stability, and they want to be sure the increase doesn’t break anything further before increasing the limit even more. That patch will also feature fixes for incorrect boss loot drops, and glitches where you get stuck in Power Armor, and will allow you to respawn at map markers even while overencumbered. There’s also a dramatic reduction in penalties when you get chilled, frosted, or frozen – the duration of your slowed movement drops from two hours to 30 seconds. On December 11, many of the PC-specific features we’ve been waiting for will finally launch – specifically 21:9 support, an FOV slider, and push-to-talk options for voice chat. More generally, you’ll also be able to gently respec after level 50, letting you choose between a new perk card or sliding a previously-allocated SPECIAL point into a different parameter. C.A.M.P. placement is getting a bit friendlier, too. If you log into a server where the space you previously held is now occupied, you can either find a new place for your base or switch to a server where the location is free. You’ll also get a bulldozer feature while building that lets you knock down small trees and rocks around your building spot. Full patch notes on each update will come a few days before release. On Reddit, Bethesda says “We know you’re frustrated and angry at the state of things right now, whether it’s the issues you’re running into in the game, or the lack of communication about fixes, updates, or news.” To that end, the community plans to make these update plans a more regular occurrence. This online take on Fallout has had a rocky launch, to say the least. Our Fallout 76 review goes into many of those issues, and the community has a lot more to request, too. It’ll take more than some simple fixes to shore up the game’s fundamental flaws, but hopefully this is a sign of things to come.